Visit this 2,000-acre preserve just north of Dallas/Fort Worth to find birds in prairies, forests, and wetlands. Two ecosystems meet at the Lewisville Lake Environmental Learning Area: the Blackland Prairie and the dry upland forests of the Eastern Cross Timbers. The Elm Fork of the Trinity River winds through the area as well. Most of the original ecosystems are long gone, but the completion of the Lewisville Lake Dam in 1955 led to the site that you can visit today. At the time, 2,000 acres were set aside for flood control, and a wilderness eventually came back. More than 260 bird species have been recorded — from common birds like Wood Duck and Great Blue Heron — to unusual species for north Texas. In recent years, for example, Barn Owls and Bald Eagles have nested on the property for the first time. In spring, you may spot thousands of Franklin’s Gulls, hundreds of Cliff or Barn Swallows, or several dozen Dickcissels. 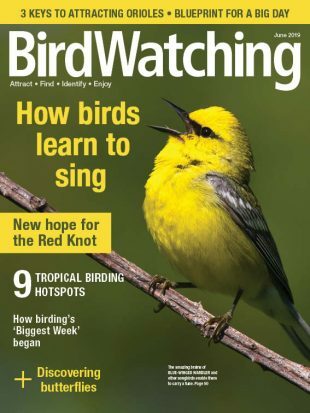 Summer breeders include Summer Tanager, Baltimore Oriole, and Painted Bunting. 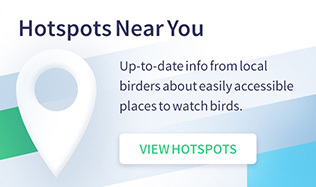 In winter, watch for a wide variety of raptors, waterbirds, and many types of sparrows. As for the trails, my favorite is the Cottonwood Trail, which is about 1.3 miles long. It will take you through wooded areas and prairie. On your hike, check out the Minor-Porter log house, an example of craftsmanship from the mid- to late 1800s. Tours are available. 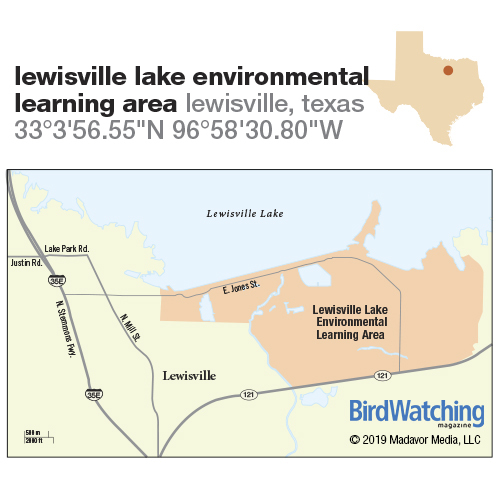 The Lewisville Lake Environmental Learning Area is a 2,000-acre property of prairies and dry upland forest just north of the Dallas/Fort Worth airport. From I-35E, exit onto N. Stemmons Fwy. Turn left at Justin Rd. and continue onto Lake Park Rd. Turn right onto N. Mill St., then turn left onto E. Jones St., and go about 1.75 miles to the LLELA entry gate. More than 6 miles of meandering trails. Spring: Vultures, herons, hawks, Northern Shoveler, Spotted Sandpiper, yellowlegs, Black-chinned Hummingbird, Purple Martin, Tree Swallow, American Pipit, Pine Warbler, Spotted Towhee, American Redstart, Lazuli Bunting, Baltimore Oriole. Summer: Wood Duck, Neotropic Cormorant, Osprey (rare), Great Horned Owl, Bank Swallow, Northern Mockingbird, Sprague’s Pipit (accidental), Summer Tanager, Dickcissel. Fall: American Wigeon, Green-winged Teal, Hooded Merganser, egrets, herons, Northern Harrier, Sandhill Crane, Stilt and Solitary Sandpipers, Forster’s Tern, Yellow-billed Cuckoo, Western Kingbird, Blue-headed Vireo, Tree Swallow, Tufted Titmouse, Northern Mockingbird, Sprague’s Pipit (accidental), Pine Warbler, Mourning Warbler, Spotted Towhee. Winter: Gadwall, Ring-necked Duck, Northern Bobwhite (rare), Northern Harrier, Red-tailed Hawk, Least Sandpiper, Forster’s Tern, Loggerhead Shrike, Cedar Waxwing, Field Sparrow, Rusty Blackbird (rare). Portable toilets near pavilion parking lot. Bird walks, 7:30 a.m. on the second Saturday of the month (except July and August). Public nature reserve. Open daily except Thanksgiving, Christmas, and New Year’s Day. Summer hours: 7-7, winter hours: 7-5. Fee: $5 per vehicle, paid at the gate, cash only, no credit cards accepted. Wear a hat, long pants, long sleeves, and closed-top trail/hiking boots. Bring a water bottle. Lewisville Lake Environmental Learning Area, (972) 219-3550. Southeast of downtown Dallas. Waterbirds, gulls, hummingbirds, Painted Bunting, and more. 18 miles north of LLELA. More than 2,900 acres of hardwood forest, prairie, and wetlands. Diverse flora and fauna. Caroline Blaha-Black is a former Elm Fork Master Naturalist, a freelance writer and book author. She also volunteers at a local wildlife rescue.